In this article, we are going to learn what vertical sum of a binary tree is and how to find it through a C++ program? Problem statement: Given a binary tree, find the vertical sum for the binary tree along each vertical line. First we need to understand what vertical sum is. Let go through an example to understand what vertical sum is. For the above tree, let's check what the vertical sum is for the tree. 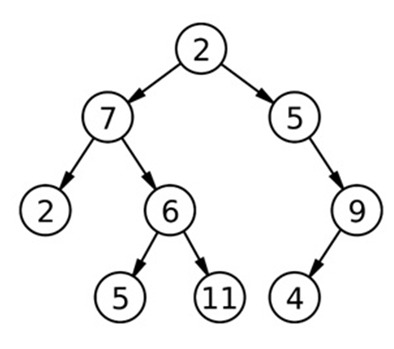 Just consider, we have partitioned the tree nodes into column & rows where rows are the level no starting from 0. Then the above tree can be converted into the above table easily. Start from root. Root column is 0. Using the above steps the tree can be easily partitioned to the table. It is to observe that there may be several entry at a specific (row, column) position. Like here, at Level3, column no 1 has two entry 4 & 11. Rest is about doing sums for each column and printing it. Thus the vertical sum output should be 2, 12, 8, 20, 9 (from col -2 to col 2 direction). Though the visual description seems to be very easy to solve this problem, in programing view it’s not that easy. The basic concept is to do pre-order traversal & while traversing we will keep track for each column (hashing)& will find cumulative sum. Thus the column is used as key & we need a map to process our algorithm. Start from root. Column for root is 0. Print the hash map to output the vertical sums for corresponding column.